Tobie picked up a lot of different games during this lengthy US trip including a number of games I hadn't heard of before. But recommendations from other gaming friends had guided him in some of his purchases at Gamex 2017 and so our collection has a whole host of interesting new players. 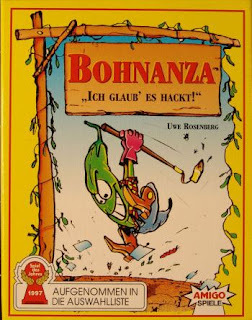 Enter Bohnanza, a German card game originally released in 1997 that remains to be one of the highest rated games for awhile. The odd premise of having everyone dealing with growing different types of beans and trying to sell them for a profit may not sound like fun, but it actually is. To add to the fun, the copy of the game that Tobie found is an older German edition with a slightly different card set from the current edition of the game, so it took us a while find a copy of the rules in English and to reconcile the difference between the types of cards included in the box. But after all that fun stuff, I have to concede that the game is more complex than you'd initially thing. Bohnanza is a set collecting card game with an interesting hand management mechanic created by Uwe Rosenberg. The game supports 3-7 players and has won many awards over the years. In the game players take turns growing various types of beans in their bean fields and selling them for coins. There are different quantities of each type of bean in the deck and the that ties into how many of each bean is needed in order to score points when you sell them. Some beans need a minimum of 3 beans before you can get any money while others are a bit more flexible. The tricky part is how you are limited by the sequence of cards in your hand as you draw them. This determines the order in which you will plant you beans each turn and thus figuring out how to optimize this is crucial to winning. To help in this area, there's a trading and donating phase where you can trade beans with other players or with two cards dealt out as trading options. Figuring out how to time new beans triggering the selling of other bean fields is crucial to scoring in the game. What I Like: The game seems simple and a little silly at first but in the end there's a fairly complex rhythm to the game that nicely drives strategy. There's a great balance between the limited number of bean fields that you have that limit bean varieties in play and the fact that you have to play cards in the same order as they were drawn into you hand. These two game mechanics alone can really wreak havoc on your brain as you try to figure out the best combinations for things. And how this plays out can make for very diverse games. I can manage my hand through trading and such in order to maximize bean set size for subsequent crops but still lose out versus a player who ends up selling beans more frequently. Then again not all bean sets are equal and aiming to collect rarer beans may be a good strategy, provided you can find them and add them to your fields. There's an elegance to how this game balances the various elements in play so well. What Could Be Better: I think the main gripe here is the lack of creativity in bean naming. It seems a bit more exotic when you own a German language version of the set like we do as all the beans sound a lot more exotic, especially when you associate the names with the cartoon art of the cards. But in truth most of the beans are just color coded as Red Beans, Blue Beans and Green Beans,so that does't say much. Then there are the rules which remain a little tricky to learn and explain to other players. The mechanics will make sense in time and with actual practice. But the initial learning curse is unusually high and one can only hope someone should have figured out a better way to explain this game by now. TL;DR: Bohnanza is a great classic card game for a reason and now I understand it has remained highly ranked across game category rankings for years. It's clever and provides a good balance of challenge and fun. And thus the game gets a good 4 silly colored beans out of a possible 5.